To Celebrate our 100th episode, we’re releasing 100 T-shirts ONLY! I can happily say…They’re beautiful, the quality is out of this world, it’s got an inside joke on it from the podcast PLUS a fantastic design! There are only 100 T-shirts available, and once they’re gone.. they’re GONE! This is an amazing way to show your support for over 100 episodes we’ve recorded of the podcast. You can think of it as less than $0.35/episode. This is the simplest (and cheapest way) to show your support for the podcast! Upload a photo of you wearing it, and you get bragging rights for ever! Get it below before they’re all gone! 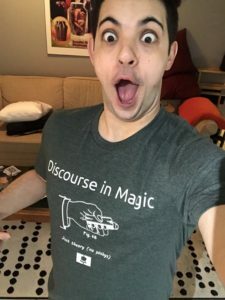 PreviousEpisode 100 – Is Discourse in Magic Ending?